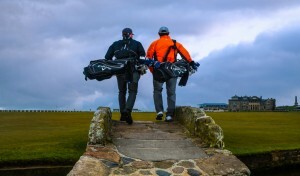 Going down the 1st at the Old Course in a play-off is dreamland, it was surreal. I'm absolutely delighted. 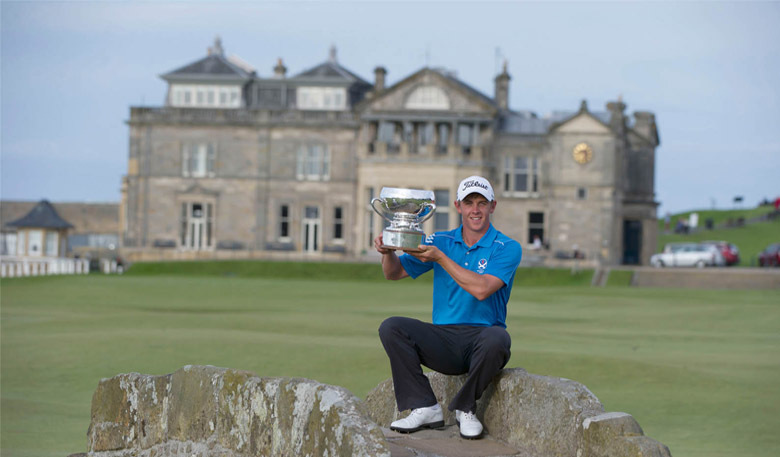 Scotland’s top-ranked amateur Grant Forrest eagled and birdied the 18th on the Old Course and then holed a 25ft birdie putt on the first play-off hole to lift the 2014 St Andrews Links Trophy, in association with Allianz. The 20-year-old from the Craigielaw club in East Lothian holed a 25-foot birdie putt from outside Blairgowrie’s Bradley Neil on the first green in extra-time to win the title, which features the European season’s best strokeplay field in amateur golf. Earlier, Forrest had eagled the famous 18th by pitching in from 30 yards in his morning round and then birdied it from the Valley of Sin to force sudden death after the 18-year-old Neil had set the clubhouse target at a nine-under aggregate of 278 with a brilliant final round 68. Forrest is the first Scot to win the Links Trophy since Keir McNicoll in 2008, and it’s likely to put him back in the top 50 of the World Amateur rankings, where the University of San Diego student is already the leading Scot. Scottish Boys champion in 2010 and Scottish Amateur champion in 2012, Grant said lifting the Links Trophy was the biggest victory of his career. “Winning the Scottish Amateur was big for me, but I think because of the strength of the field here this has to be the best,” he said. Leading by two shots after 36 holes, Forrest admitted he felt “things were falling apart a bit” in his morning round before his one blow on the 18th restored his advantage for the final round. “I was going really well, but then ended up hitting into the wrong places, and suddenly I’d had a triple bogey and three more bogeys without playing that badly,” he said. The leaders were set an early target by Prudhoe’s Tom Rowland, out in the first group, who raced round in 65 and spent three hours waiting with the clubhouse lead. But with so many within reach of the lead – 11 players were within two shots as Forrest reached the back nine – despite the wind into the faces of the players on the final stretch it was always likely someone would get past him, just a question of who. For a while it seemed three Scots would stay the course in Neil, Forrest and Jack McDonald, all of whom reached nine-under. McDonald, the Stirling University pure maths student, raced to three-under at the turn to launch himself into contention but bogeys at the 13th and 17th left him two back. Neil, meanwhile, was even more impressive, with seven birdies in his final round offset with just the one dropped stroke, at the tough par three 11th. But the real key was Bradley’s superb birdie at the 16th, to a tough pin tucked at the back left of the green. 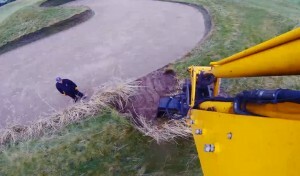 “I had 170 yards to the pin, with the wind slightly against, and hit in to 20 feet and rolled it in,” he said. Bradley had pulled his drive in his morning 71 into the hotel out of bounds in the morning and so took a little off his tee shot in the afternoon, eventually just lipping out for his par. On the last he left himself a tricky comeback putt of five feet after going for what would have been more insurance with his first putt, but made it to set the target. Forrest felt a bit becalmed on the front nine in the final round, until birdies at 12 and 14 got him to nine-under, only to drop a stroke at the 16th. A six footer for par at 17 gave him a chance up the last, and he “put everything I had” into the drive right up into the Valley of Sin, putting up to three feet for the tying birdie he needed. In extra-time Neil looked to be better off at 15 feet away in two, but Forrest’s 25-footer always looked dead centre, and the youngster missed his chance to keep the contest going.